For the past few reports we have been looking at some of the releases from 1979. Some of these models may still fit into the current miniature range today and be easily recognizable. The Chevy Van and Tractor do not seem to have changed that much over the years. However, if we reverse the process maybe the Pick-up shown below could feature and maybe the 1956 Buick Police Car could sit comfortably in the 1979 range. I don’t believe that many models from a bygone age sold that well, with the exception of the Model A Car and van and the Model T Van. All images shown are provided by kind permission of Mattel. 1. Well, that is very, very sad news about the Land Rover LR4 - very sad indeed. Was really looking forward to that one-it would have made a brilliant matchbox and would have got lots of use as a casting. Mattel must get fed up with investing so much time and effort into models that never make it. This licencing business is beyond pathetic. I'd love to know the reason it isn't going ahead but I understand that is most likely confidential. The Matchbox team is on a strict development timeline. There can be delays with making this happen which is why we did not pursue it further. 2. It is strange how many models are being introduced into the HW range which are models that could have been good Matchbox models. Recently introduced are the Alfa-Romeo 8C, Fiat 500 Nuovo, several Lamborghinis and Lotus Evora. Yes, there is often some cross over between the orange and blue brands. 3. Question; Were any Resin/3D examples of the LR4 ever produced and if so would we be able to have a look at what would have been? What a shame it is not going ahead. Sorry, we are not at liberty to show prototypes of items we are not producing. 4. Any reason why the Matchbox name is not on the following vehicles - Ford Bronco 4x4, Ground Grinder, both motorcycles and the new Ground Grabber. There is space for it. Can this be rectified? We cannot always rectify this. In some cases there is no room. The Mattel name takes priority in these cases since the brand name is already on the package. 5. I as a major Matchbox 1-75 Collector I would love to see more of the following cars present and future in the Matchbox Line. Mercedes Benz, BMW, Audi, VW, Nissan, Honda, Ford, Seat, Peugeot, Subaru, Aston Martin, Bentley, Cadillac, Jaguar, Lexus, Range Rover, Maserati, Rolls Royce, Tesla Model S. And the following super cars Bugatti, Corvette latest, Dodge Viper latest, Ferrari, Hennessey Venom GT, Lexus LFA, Jaguar XKR-S GT, Koenigsegg Agera S, Lamborghini Aventador Roadster and Coupe, Mclaren, Pagani Huayra, Pagani Zonda Revolucion, Porsche, SSC Tuatara, Dagger GT and the Zenvo ST-1. You will see a few licensed models in this list in the future but some we will not do since Hot Wheels has them already and we do have a different brand strategy. 6. Could you ask Mattel if it is ever possible to make a stretch limousine Matchbox Line (like what majorette did with their limousine diecast), using the Team Matchbox Convoy Car Carrier Trucks as the desired length for the Matchbox Limousines. Interesting idea but it does not fit the Matchbox brand strategy. 7. And will we ever see the return of the Matchbox Premiere Collection and more of the Matchbox Superfast Line? Not with this type of execution. The first three models will be part of the Mission Force Arctic adventure. This is a new tool for the year called the Ford F-350 Stake Bed truck. This truck has a tilting stake bed on the back and will be in the construction segment. The Ford Tractor & Harrow entered the range at #46 in place of the generic Stretcha Fetcha. Unlike the heavily customised Big Bull and Mod Tractor, this was an authentic reproduction of a Ford Tractor, although some would argue it was not a particularly attractive piece and has never been a model to create much interest. However, it is perhaps more authentic than the current Tractor in the miniature range, but I show both for your comparison. Originally available in medium blue, play value was enhanced by virtue of including a light yellow plastic harrow which hooked on to the back of the tractor. This harrow was sometimes made in a much darker yellow and this variant is not that easy to find. The interior was off white or cream, the base plated, and the slim plastic wheels, small at the front and large with heavy tread to the rear, were exclusive to this model. Originally these wheels were plain black, though later, perhaps to enliven a rather dull looking model, the rear wheels, and eventually all the wheels were given yellow hubs. Although this model was a Superfast release as indicated on the base, these unique wheels were not ideally suited to rapid movement and if given a gentle push the Tractor would move only a short distance! Here are some examples in various liveries. I am sorry but I have no pre-pros of this model. There is not too much difference possible between the old and the new tractors. Originally this model had the name Ford both on the base and above the grille moulded into the bodywork. It is unclear what arrangement Lesney had with Ford in regard to this casting, but after a couple of years the Ford name was removed from the bodywork, yet strangely remained on the base for some time thereafter before finally also being erased. During 1981 the model was re-coloured light metallic green which some thought was a great improvement visually if somewhat less authentic! Some examples can be found in a deep metallic green which is even more appealing. The green models all have yellow hubs. Some green examples do include the Ford logo above the grille despite blue ones existing without, which could indicate some old castings being used up or perhaps there were two moulds running and one was amended later than the other. This model was included as part of a Two Pack with the Hay Trailer instead of a harrow in 1980, first in blue and then green the following year. It disappears during 1982-3 only to reappear as a Two Pack in 1984, now made in Macau and now in blue once more, with a pearly silver base! Also during 1984 the green bodied Tractor was discontinued in the miniatures range, whilst continuing in blue in the Two Packs until 1987 when it was re-coloured orange-yellow with orange hubs! In 1989 it was changed back to green, although a non-metallic variety, but maintaining the orange hubs. Finally in 1991 the new #27 Mercedes Benz Tractor replaced the #46 as a Twin Pack model towing the Hay Trailer. However the #46 did also appear in some farm related Gift Sets with a red or black harrow, so beware Lesney examples being sold with “rare” or “pre-pro” red or black harrows which have simply been taken from the later issues! The #47 Pannier Locomotive followed the release of four train based models in 1978. It would however be the last of such a theme, as although all being sympathetic to genuine rolling stock, none ignited that much excitement amongst the vast majority of collectors. The Pannier came with a rich green body and “GWR” labels, large train wheels and a narrow metal base over a plastic lower section. The metal base was mostly found in gloss black, but rarer examples can be found with a charcoal base, or the moderately desirable metallic brown base (the same colour base as found on some of the silver #3 Porsche Turbo). Unpainted base versions also exist in small numbers, but premiums are not significant. No other variants exist on this model, which was deleted in 1982 in favour of the Jaguar SS100. Two early pre-production samples are shown here in military green – presumably there was plenty of spare paint in this colour! The #61 Wreck Truck was a replacement for the #74 Toe Joe which had just been deleted. This was quite a basic design Wrecker, but has always proved quite a popular model, especially in regard to the rarer variations, of which there are many! Originally the colour scheme was red, with a matt black base, white booms, red hooks, and blue tinted windows. After a short while the windows were changed to amber and were to remain thus on all subsequent variations. The blue window version is not that easy to find. One interesting point about this model is that the booms were changed so that rather than having circles running along them as per the Toe Joe, they had a zig zag pattern instead. It should be noted that the Toe Joe continued to be produced in the Two Packs range into 1982, and so all Toe Joe models from 1979 onwards will have the zig zag design of boom. However no Wreck Truck should be found with the circle design on the boom. One rare variant of the red Wreck Truck has green booms with the zig zag design. The Toe Joe originally came with green booms, and forgers are able to swap these around to create a “rare” Wreck Truck. However they often make the mistake of using green booms with the circle design, which proves it to be a forgery. Some may argue that Lesney simply used up old Toe Joe booms, which can never be proven one way or the other, but the rare Wreck Truck with green booms was only found in 1982 Two Packs four years after the Toe Joe was deleted, so it is unlikely that such booms were used. The three models shown below are all colour trials. The white model never had booms fitted. Alas the ability of forgers to swap booms on these models has meant genuine examples now tend to suffer as values have dropped owing to the number of forgeries in circulation. A particularly unfortunate example is the green Toe Joe with white booms from the Wreck Truck. All white booms have the zig zag design, but they only appeared on later Toe Joes with 5 arch wheels and a darker green body. In recent years many pale green Toe Joes with 5 spoke wheels, which were not produced after 1975, have turned up with white zig zag booms which were not made until late 1978/early 1979, so clearly they are all very likely to be fakes, which is a very sad state of affairs, especially as the excuse is always made that Lesney put anything and everything together to produce a model. However it is strange then that, so far as I know, not one has ever appeared in a sealed blister pack! The red Wreck Truck with amber windows can be found with white or red booms and black or red hooks and matt black or charcoal bases. It is thus possible to find an all red variant, which is particularly attractive. The colour scheme was changed to yellow with red booms in 1981, again with black or slightly less common red hooks. The shade of yellow can vary, with lemon yellow the hardest to locate. Some examples come with booms that are very pale red and the base can be found in gloss or matt black, charcoal, blue grey, dark brown or even unpainted! Some yellow models come with green booms with black or red hooks which are more desirable and perhaps the hardest variation to locate is yellow with white booms, which can be found with both shades of yellow body and both colour hooks and fetch healthy prices. 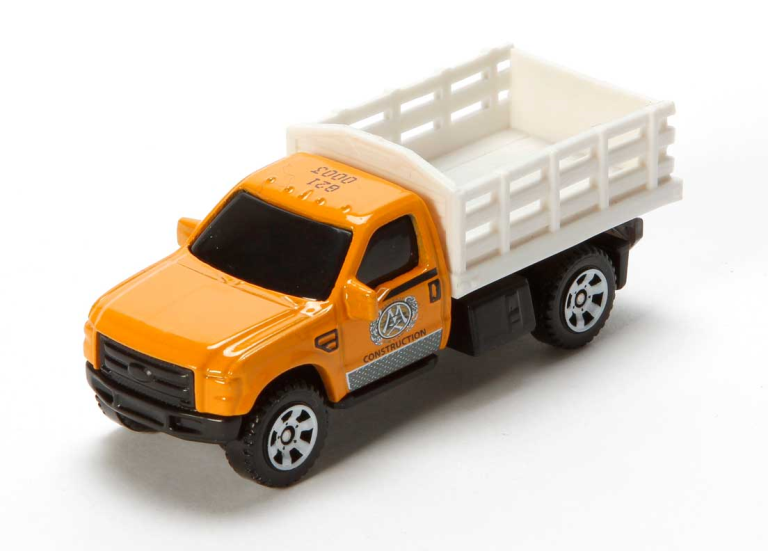 The final release of the Wreck Truck, which is also the variant most often found in Two Packs, is a red version with white “24 Hour Towing” tampo print. These nearly always come with white booms, (very occasionally red), though again with both colour hooks. In 1982 Lesney introduced the Convoy range, and at the same time many new Kenworth and Peterbilt models were incorporated into the miniatures range. It was decided to produce a Peterbilt Wrecker, which thus replaced the Wreck Truck at the same #61 position. It is surprising just how many variations of the Wreck Truck were produced considering it was in the range for barely four years. The #68 Chevy Van was a slightly customised model with large rear wheel arches and large dot dash rear wheels compared to medium sized 5 crown front wheels. However this is another one of those half dozen or so models that is not infrequently found with the wheels in reverse, or both type of wheel front and rear and, as such, examples do elicit quite a lot of interest. The very first release had windows that were smoked but clearly see through, which was an issue as the model had no interior and such windows emphasised this fact. They were thus changed to a blue tint which was less easy to see through. The early smoke glass versions also include an extra small portion of tampo print forward of the front wheel arch, which was removed at the same time as the smoke windows as it was difficult to print in that area. However whilst this variant used to be considered very rare, it strangely now elicits far less excitement. An orange body was complemented with red and blue stripes. Some of these issues appeared in a much darker shade of orange and are very collectible. Later the stripes changed to red and black and this is probably the most commonly found issue. However this issue alone included red, amber or green windows instead of the normal blue, with red not uncommon. The dark yellow model is a colour trial and the two models with Matchbox labels were early ideas for the Collector Club van. The orange body was used again, only with blue windows, when blue and white stripes were applied, and this is not a commonly found issue although it is not much sought after. Two issues then appeared in white, one exclusively in the United States with blue and red stripes & “USA-1”, and a German issue with “Adidas” in dark blue. This German exclusive commands a healthy premium. In 1980 a Collector’s Club was initiated where an orange model Chevy was used as the Club model, but using a label instead of a tampo. This club was not successful and surplus orange models were packaged without the label for general sale. Such plain orange examples are not as rare as some would claim! In 1981 the model was re-coloured to a very attractive bright green colour, and the tampo print included the name “Chevy” for the first time, either in yellow, or in brown which was slightly rarer. During 1982 the colour changed again to silver with “Vanpire” tampo. The Chevy Van was used extensively with NASCAR. Here are a few pre-production samples. The Tide van was stopped at the last moment owing to licensing problems. This version can be found with a silver painted base as well as plated which had been the standard on all previous issues to that date. When the model was converted to a Macau based model, the body colour changed to a brighter silver shade and the base was now sprayed gloss black. Prior to this transition to Macau, the Lesney base was modified to accommodate large maltese wheels and the name was changed to Chevy Van 4 x 4 and released exclusively in the USA in 1982, at #44 and in metallic light green, with “Ridin’ High” tampo in white. However, an extremely small number of these bodies were inadvertently fitted with #68 Chevy Van bases, and such examples command a serious premium, as well as being very attractive pieces. This is more than can be said for the 4 x 4 which looks decidedly clumsy, even when the colour was changed to a much darker green shade! The black based Macau Vanpire Van was deleted during 1983 so that in the rest of the world the 4 x 4 version could supersede it in the #68 slot, now in white with “Matchbox Racing” tampo. In this guise it survived until 1986, although several promotional issues were produced using the original Chevy Van body, including the Thailand based powder blue “Boston Gas” which is very hard to find. Racing sets were also released with the original Chevy Van featured in different liveries. The Chevy van in its original 1979 incarnation was also reproduced when the “Retro” range of six models was released in special packaging in the late 1990s. This was a curious choice as the other five models were all of Hot Wheels styled models from the early 1970s - Dragon Wheels, Big Banger, Pi Eyed Piper, Dodge Dragster and Tanzara! These two Ridin’ High vans and the green version are all pre-production samples. The new #69 was a Wells Fargo Security Truck, or Armored Truck. As an American vehicle the name was actually spelt correctly on the base as Armored rather than “Armoured”. This model was painted red with white Wells Fargo tampo print, blue windows, a silver painted base and 5 crown wheels. The story about the phone number above the front wheel arches being real and thus having to be changed to a code reference instead is well known, the fact it took so long to alter however is surprising! An even more obvious variation is to do with the windows, which range from a very pale blue to an extremely dark blue. This model came with a white plastic roof which is prone to fading and goes a rather unattractive dirty cream colour. The windows are likewise prone, and tend to go a green shade, so if you think you have found a rare variant beware as many are green at the front but still blue toward the rear! A genuine rare variation is one without any tampo print, but again you have to be cautious as the white tampo on this model rubs off very easily. However the body has so many narrow recessed channels that removing the tampo entirely is not as easy task, forgeries will have some very small traces of white remaining in these channels! An extremely rare variant apparently is one with an unpainted base, but this is probably as rare as Tyre Fryers with unpainted bases. Some examples can be found with very dark red bodies, both with and without tampo print, and are rare, the standard shade is bright red. The metallic purple model is a colour trial. The Security Truck was produced in a medium green shade as an exclusive German release in 1981 with “Dresdner Bank” tampo print in white, and was once considered rare but now sells for just a few pounds. Although the red edition was deleted from the Miniatures range in 1983, the green model was produced again, now in Macau for the first and only time, in 1987. The shade of green was now clearly darker in appearance, and this variant is far rarer than the Lesney version as fewer were produced. The final release for 1979 was the Bomag Road Roller, replacing the long running SRN6 Hovercraft in the #72 slot. This model was all over mustard, with a red interior, 5 crown rear wheels, and a two-part roller at the front. This model initially came with chromed hubs on the rear wheels but these were soon changed to yellow hubs. Contrary to popular belief, it is in fact the chrome hubs that are much harder to locate than yellow hubs, though neither creates much interest. The only other variation is the shade of the red interior, which is quite bright on a small minority of models. This model was deleted in 1982, being replaced by the Dodge Commando. However it made a surprise reappearance as the new #68 in 1991, now as a Matchbox International made in Thailand model. It was coloured orange, with blue tampo print (later black on a slightly paler orange body), a grey interior and with wider style 5 crown rear wheels. The very next year it reverted to a mustard colour, now with a red tampo design and maintaining the wider style rear wheels. It survived in this second incarnation into the Tyco era, finally being replaced in the miniatures during 1995. However this was still not the end of the story, as in 1999 it was to make two further (and final) appearances, now of course as a China produced Mattel model! The first was in an unusual blue colour with white stripes, and the second in orange once more, but now with a white roof and black interior, and released as a German exclusive, twenty years after the initial release! Two pre-production models are shown below. Finally – one that got away! My thanks again to Graham Tomlinson for his kind help in compiling this section of the report.